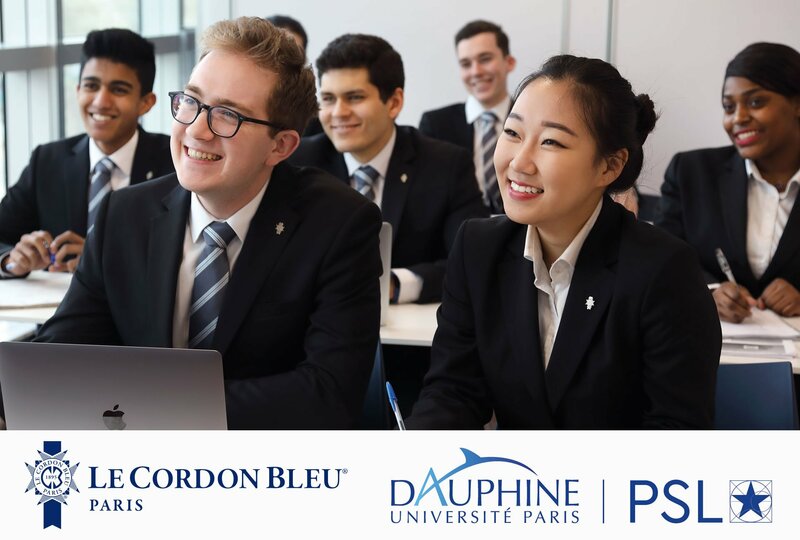 From 22 October 2018, Le Cordon Bleu Paris institute 3rd year Bachelor of Business in Culinary Arts Management and Bachelor of Business International Hospitality Management students, will study at Paris-Dauphine University three days a week. Students who have successfully completed the 3 year programme will be awarded an international “International Bachelor - Talent in Culinary Arts and Hospitality Management” diploma from Paris-Dauphine University and a “Bachelor of Business in Culinary Arts Management” or “Bachelor of Business in International Hospitality Management” diploma from Le Cordon Bleu institute. Paris, 30 May 2018 – Le Cordon Bleu Paris institute, the leading Global Network of Culinary Arts and Hospitality Management Institutes, and Paris-Dauphine University, a higher education establishment which is a benchmark in the field of Organisation and Decision sciences, today signed a partnership agreement. This first partnership is for the two Bachelor programmes, which are aimed at talented young French and international students, whose goal is to become gastronomy and hospitality managers. Le Cordon Bleu Paris launched two Bachelor programmes in 2016: a Bachelor of Business in Culinary Arts Management and a Bachelor of Business in International Hospitality Management. From 22 October 2018, part of the third year modules of the Bachelor training programmes will be taught by lecturers at the Paris-Dauphine University campus from Monday to Wednesday. This third and final year of the training programme focuses on the student’s specialisation and learning business management skills specific to gastronomy and hospitality, in order to equip them with the keys to success in the business world. The main modules concerned are: marketing, management, human resources, customer relations, social networks, finance and accounting. Specifically designed with international careers in mind, the programmes are taught in English and French (translated into English) for the professional modules. Students who have successfully completed the programme will be awarded an international “International Bachelor - Talent in Culinary Arts and Hospitality Management” diploma from Paris-Dauphine University and a “Bachelor of Business in Culinary Arts Management” or “Bachelor of Business in International Hospitality Management” diploma from Le Cordon Bleu institute. There will be a maximum of two graduating classes per year, with a minimum of 25 students per class. The majority of 3rd year programme students will have taken the first two years at Le Cordon Bleu institute. This partnership with Le Cordon Bleu, a renowned Institute with a presence in 20 countries, is perfectly in line with our long-term strategy for developing our international reach via quality partnerships. She continues: "We will welcome our first “International Bachelor - Talent in Culinary Arts and Hospitality Management” programme students in the 2018-2019 school year. Paris-Dauphine will develop their entrepreneurial know-how by focusing on fields in which our expertise is widely recognised – from finance and marketing, to project management and customer relations.